Thursday Afternoon Update: Final Location Counts: Despicable Me 3,474 (new); Predators 2,669 (new); The Girl Who Played with Fire 85 (new); Grease Sing-a-Long 12 (new); The Twilight Saga: Eclipse 4,468 (0); The Last Airbender 3,203 (-34); Toy Story 3 3,753 (-275); Grown Ups 3,463 (-71); Knight and Day 2,628 (-476); The Karate Kid 2,458 (-651); The A-Team 1,236 (-917); Get Him to the Greek 433 (-451). Wednesday Afternoon Update: Universal's Despicable Me looks poised to end The Twilight Saga: Eclipse's run at #1, but there's also plenty of room for Predators to find an audience. Despicable Me represents Universal's first foray into the world of modern 3D animation. While Disney/Pixar and DreamWorks Animation have dominated the space, Fox still has its lucrative Ice Age franchise and Sony found success with Cloudy with a Chance of Meatballs so its about time that Universal tries to make its mark. Despicable is something of a tough sell considering that its protagonist is a villain and it's not based on an established property. Plus, it will have to compete with the Toy Story 3 juggernaut as well as The Last Airbender for the attention of 3D enthusiasts. As a result, Universal should expect numbers much closer to Cloudy's $30.3 million opening/$125 million domestic cume. According to the most recent BOXOFFICE WebWatch report, Despicable Me holds a solid 11.8% market share of online opinions among unreleased films. After getting off to a slow start, Despicable Me is also inspiring a healthy number of tweets. On Facebook it has recorded a healthy 52,730 fan increase from Sunday morning to Wednesday afternoon. 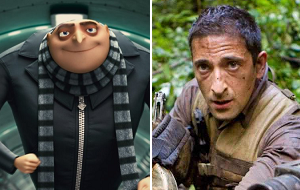 Flixster spokesperson John Singh reports that pageviews and direct searches for Despicable are both up a staggering 200% on the popular website. "Despicable Me has notably solid support across the board, with all gender and age-group demographics showing interest, though at substantially lower levels than Toy Story 3 or Shrek Forever After," says Singh when discussing Flixster activity. As of 4 p.m. PT, Fandango.com is reporting that Despicable Me is responsible for a respectable 7% of daily of sales. Look for Despicable Me to rake in a solid $36 million from around 3,200 locations during its debut frame. The concept behind Predators is the major selling point considering that stars Adrien Brody, Laurence Fishburne, Danny Trejo, Alice Braga and Topher Grace are far from reliable draws. Unfortunately, a sequel/reboot fatigue definitely seems to be setting in this summer and Predators may end up a victim of it. Male moviegoers who are too old for the PG-rated thrills of The Last Airbender will be enticed by the graphic violence and uncompromising action scenes that the Predator franchise is known for. With a 5.45% market share, Predators ranks behind Despicable Me in the latest WebWatch report. Still, it has managed to fend off other high-profile summer releases such as Salt and Scott Pilgrim vs. the World. The most active Predators page on Facebook hasn't even reached 6,000 supporters yet, which gives it a lower total than Jonah Hex. On Twitter, it's trailing Despicable Me by a healthy amount. Predators has yet to break into the top five on Fandango. After a strong opening, The Twilight Saga: Eclipse should drop to second place this weekend. Summit's property is going to be as front-loaded as they come, and a decline of nearly 60 percent from last weekend in likely. Eclipse still leads daily sales on Fandango with 40% as of 4 p.m. PT.